I've noticed that quite a few Book Club Friday linkups have included the Pretty Little Liars series but, truth be told, they never really appealed to me, but when I got my hands on a virtual copy of the first nine (yes, nine...there are actually 12) I figured that I'd give them a go (thanks, Kelly!). Four days later, (yes, four) I read eight of them. Suffice it to say, I loved them. 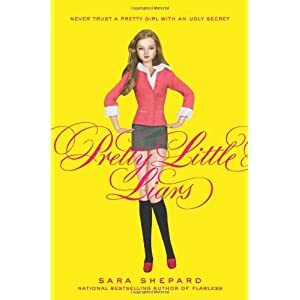 The fact that Sara Shepard was able to write a series with a t-w-e-l-v-e book plot arc is freaking unbelievable. I can barely think of a way to write a book with a sequel, let alone a series of 12. It's mind blowing. For reals. And here's the craziest thing about the Pretty Little Liars series: I hate all of the main characters. Yes, you read that right. I hated Every.Single.Main.Character. They are awful! AWFUL! Snide, snarky, mean girls but I can't get enough of them! Just what are they going to get up to next? With unlimited credit cards, the sky's the limit, people! Spencer - An A-type personality to the tee, from an insanely wealthy family with a bitchy older sister, who is involved in about one million after-school activities. Aria - The "arty" one of the group who dresses a bit like a Goth and lived in Iceland for a few years. She's wise beyond her years but that doesn't mean she makes the smartest decisions. Emily - a competitive swimmer who is somewhat conservative. She struggles more than others with her identity but that just makes her the most endearing of the bunch (not that she's terribly endearing, though). Hanna - The Queen Bee of the group. A formerly-overweight-child-turned-fashionista, she's incredibly preoccupied with staying popular and will pretty much step on anyone to keep her place in the "in" crowd. They all live in Rosewood, Pennsylvania, and attend a super-elite private school that doesn't resemble the one that I went to--at all. There's a uniform but it seems to only include a kilt because there are Manolos and Choos as far as the eye can see, plus some kind of coffee shop where they're perpetually filling up on caffeine. And gossip, obviously. The series starts when the girls are in high school, but know each other from junior high. Although they're not friends anymore, they used to be. That is, until their BFF Alison mysteriously disappeared, which was the catalyst for the group dissolving. But, years later, Alison reappears. Or, they think that she's appeared because all four girls start getting emails and texts alluding to secrets that they're keeping, and they're all signed by "A." And, man oh man, are there secrets. Every single one of these characters has legit skeletons in their closets. Multiple skeletons. Millions of skeletons. In fact, I'm surprised their closets have any room at all for the various designer duds they all sport. And this mysterious "A" isn't just sending the girls threatening texts, he/she's also TOTALLY screwing with their lives. In very creative and terribly creepy ways, I might add. The plot twists are bananas, ladies and gentlemen, and there are SO MANY! I've never been so invested in a series, and I repeat: I don't like a single character! But that's where the talent of Sara Shepard lies (haha) because even though I wanted to scream "WHAT ARE YOU DOING?!?!" to all of them, they were also all so vulnerable that I just HAD to know what happened. And Ms. Shepard manages to end each book at the exact moment that forced me to pick up the next one. It was like I was held hostage, in a very fancy thought-prison. I'll admit that after the ninth, I needed a break but I have full intentions of reading the remaining three. So if you're looking for a series that you can really sink your (capped) teeth into, this may be the series for you. The best way I can describe it would be a fusion between LOST and Gossip Girl (although I haven't actually watched Gossip Girl but have friends who have and it seems fitting). There are slight lulls at times but that's understandable because there are twelve books. The good news is that significant plot arcs work in four-book sections, so if you wanted to, you could read four at a time and then take a break. Or, you could be like me and read nine. Whatever floats your very expensive boat! Haha!! And...err...I posted a review last week and was "sure" that I linked up, but...well...I didn't (*headdesk*). So click here for my review of Cinder. I'm always looking for a good series to get hooked on. Maybe this will be next! Have you watched the TV show? I haven't read these, and while I do think I'd like them, I'm not sure I'm ready to make the investment into the series. Although I know it didn't take you that much time to read them, so it wouldn't take that much time. But I'm also a little leery of having to track down or purchase so many books. I stopped after reading #8, but omg, I loved them! I'm now addicted to the TV show! ...and it may be one reason my blogging has suffered as of late. Stupid PLL girls! I always said that I am going to hate myself when I read the books and then start watching the show. The previews for it are so over-sexualized and cheesy. Blech. But I really want to read the books. My SIL told me they were amazing a few years ago and I still haven't gotten around to them.